about it. Considering my primary goal today was to finish strong, and I didn't do that, I'm handling the disappointment quite well. For those of you who haven't been reading this blog for the past 9 years, I DNF'ed this race in 2010 and in 2012. I was registered for it in 2011, but was injured so that was a DNS (Did Not Start). I chose this particular marathon to get revenge on those DNFs. My time goal was in the neighborhood of 3:12, which would be a PR by 3 minutes, at a pace of around 7:20. My training indicated that this was realistic. Even though we do everything in our power to make race week go well, it's not always possible. I was focused on eating healthy, avoiding germs, hydrating, and getting plenty of sleep. And while I thought I did all of that stuff well, I was unable to avoid stress in my life. This week was particularly stressful for reasons I won't address right now. I think I handled the stress well, but suffice it to say I had a lot on my mind, not related to running. And admittedly, I started to worry that the non-running stress would affect the race, so then maybe it became a little bit of a vicious cycle. feeling so wound up and anxious about the race because on both occasions, the weather was warm. And now, here I was, with my 2020 BQ already in hand, and two Boston Marathons under my belt, showing up to the Shamrock expo. It was a good feeling. 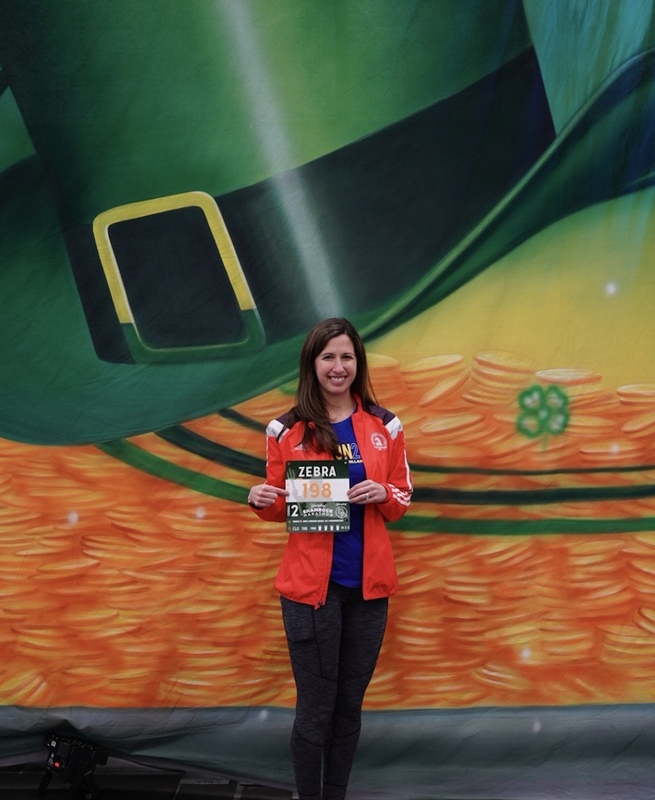 The Shamrock Marathon has great SWAG and a tempting selection of race apparel for sale at the expo. I couldn't resist a Brooks half-zip with the Shamrock logo since I am always looking for mid-weight half-zips. I was kind of worried that if the race went poorly then I wouldn't want to wear it afterwards. 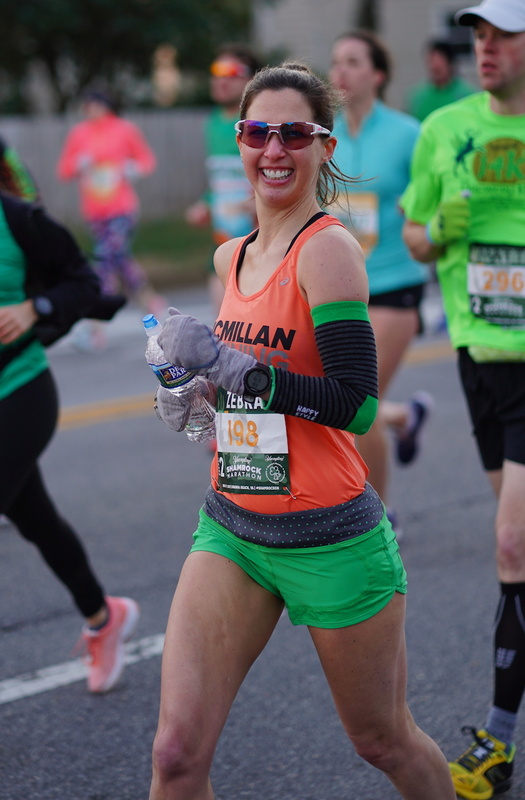 But then I decided if the race went poorly, I would associate the half-zip with the 2016 Shamrock half (a PR) since it didn't have a year on it! After the expo, Greg and I went to check into our hotel. Since we are Gold members of Marriott, we were given a free upgrade to a large suite. This suite had a bedroom, a bathroom, a living room, a kitchen area, and two oceanfront balconies. A sweet suite! As such, I had plenty of room to stage all my nutritional items in the kitchen and my race outfit in the living room. We then went out to dinner with our friends Hannah and Alex at the restaurant we ate at in 2016. It was fun catching up with them, and they announced that they were expecting their first child in October! I ordered the same meal I had the night before Rehoboth Beach-- chicken parmesan without the cheese. I felt calm, relaxed, and in a good mindset. I wasn't anxious or nervous about the race at all-- I was mainly excited. I slept for about 7 hours, but it wasn't very restful. It was nice from about 8:30-midnight, and after that, I kept waking up. This is somewhat normal for the night before a marathon, so I didn't stress about it. Our hotel was only 3 blocks from the start line. This is one of the reasons I love this race-- super easy logistics. We left our hotel room at 7:05 and then hung out in the hotel lobby until 7:15, allowing me to use the bathroom just 15 minutes before the race, which was ideal. I warmed up for about half a mile by jogging to the start line, and then around the start line. At this point, Greg left me so he could walk up a bit to stage his photo shoot. At the start line, there were two separate Instagram runners who recognized me. 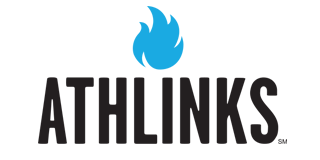 It was really cool to connect with people "in real life" instead of just online. I felt pretty good and I knew I was ready to run a strong race. With three minutes left to go, I tossed my throw-away hoodie and watched the clock tick slowly to 7:30.
to be a great race. After the first mile (where I passed Greg taking photos), I ditched my throw-away arm warmers. It wasn't all that cold at 41 degrees and sunny, so I didn't need them. They were actually a $2 pair of Walmart socks that I cut the feet seams out of. It was a little windy during the first two miles, but then we made a slight turn and it was fine. I just focused on staying relaxed and enjoying the race atmosphere. 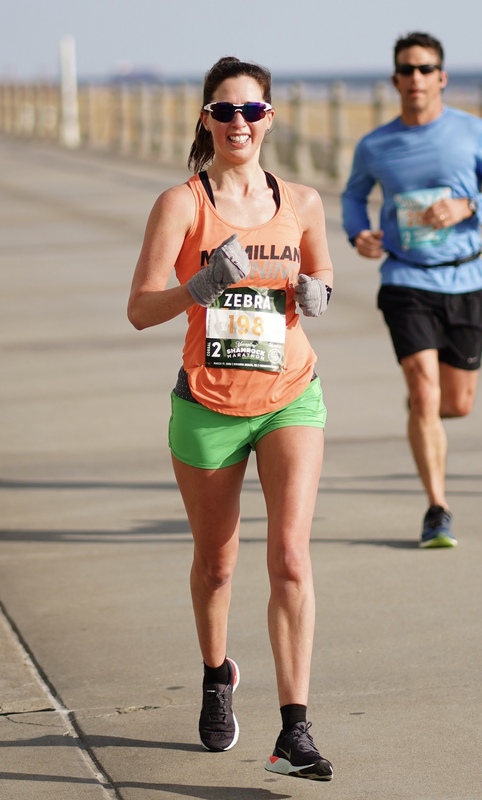 I didn't want to get too much into my head, so I observed the runners around me, and remembered when I ran the half in 2016, and it was pouring down rain with high winds. The plan here was to be in the high 7:20's, but I wasn't going to force it. I wanted the effort to feel moderate for the first 10K, and I wasn't going to be a slave to the watch. A runner recognized me from Instagram and said hi. And I found myself running with her for this entire stretch. Sometimes she would take the lead, and then sometimes I would be in the lead. Everything had been going beautifully up until this point. And then we hit a strong headwind. I would estimate maybe 12-14 mph sustained. I was not expecting more wind until about mile 19 when we ran north again, since the forecast showed the wind coming from the north. But the wind was actually more eastwardly than it was northerly so those three eastbound miles were unexpectedly hard. I wish I had been more mentally prepared, but I adapted pretty quickly. And by adapted, I mean I mentally adapted and didn't get frustrated. I did not physically adapt by slowing down. My plan was to start hitting marathon pace (7:20) at around mile 7, and I didn't want to back off that plan, despite the wind. I really didn't want the wind to slow me down, and I told myself I could push through it. In hindsight, maybe that was a mistake because I was probably exerting too much effort too soon. You don't want to be straining at miles 7-8 in a marathon, and I was straining. Wind be dammed! I had a target pace to hit! I was still running with my new friend during these miles. She looked really strong, so I told myself I must be just as strong if I am running that same pace. Ultimately, she she sped up and passed me in the 9th mile, but she was running the half and really going for it at that point. Finally we were out of that wind. So now it was time to recover. I told myself that races have their hard stretches, but then you can recover and move on and feel good again. I took my UCAN shortly after passing the mile 10 marker and it went down okay. The great thing about that was that after drinking water with it, I could toss my bottle and not have to carry it any more. Surely that would make everything feel better. So no more headwind, no more water bottle to carry, just nice and strong running. Well, it still felt unsustainably hard. Mile 11 felt more like mile 22, and no matter how positive I tried being, my body just wasn't cooperating. So. . . how to salvage the race? I thought to myself that it wasn't a PR day, but I could get my backup goal of 3:17:19. That's the date of the race! That would still be within my reach if I could hold a pace of around 7:32. Yes, new goal! But by the time I got to mile 12, I started doubting that goal. And then I told myself not to even think about my finish time, but simply focus on finishing to the best of my ability. My main goal here was to finish strong, so all I needed to do was to keep running and keep doing my best. And by the time I got to mile 13, I started to wonder what would motivate me to get to the finish line, since I was already feeling so beat up. I know. . . it would be my fastest "bonk" ever! When I crashed at Indy Monumental, I still ended up with a time of 3:43, so if I beat that, it would be a bonking PR! I saw my friend Cristina (who had run the half) cheering for me at this point, and that really perked me up. For like 20 seconds, things were really good. come hell or high water. Yes! I knew I would see Greg just before mile marker 14, and I wondered if I should stop and consult with him. After all, I wasn't worried about my time anymore, so I could afford to stop for a brief conversation. Somewhere between the halfway point and mile 13.8 I began to wonder why I would be putting my body through the torture of a "bonk". What for? I already know I can run a 3:15 marathon, so I don't have anything to prove. And then it would take two weeks to recover and I wouldn't be in a great spot for the Cherry Blossom 10-miler in 3 weeks. Hmmm. . . drop out and have a shot at a nice PR at Cherry Blossom, or keep going, have a miserable experience, and then sacrifice two weeks of training for Cherry Blossom. That made my decision clear: I would rather have one strong race than two mediocre ones. 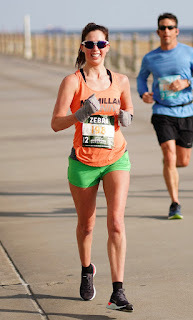 I had a marathon PR that I was really happy with, but I felt like I could really smash a 10-mile PR. So, once I got to Greg, we chatted about it, going back and forth. I actually told him, "Wait here for 20 minutes while I attempt to run again and I will see how I feel." But after going maybe 1/10 of a mile, I realized what horrible shape my legs were in. It was as if I ran a half marathon at half marathon effort. It was pointless to continue. As much as I wanted the medal, and the hat, and the towel and the finish line glory; I knew that today wasn't the day for it. So, within a matter of about 30 minutes, my race took a turn for the worse and ended. After weeks and weeks of hard training, it all came down to 30 minutes that just didn't go my way. But that's how the marathon works and that's the allure of it. When I think about what went wrong, I think it was probably a combination of the stress I had this week and fighting too hard against the wind so early in the race. Mile 8 is not a time to be fighting in a marathon. It's crazy because I feel like on any given day in training, I could have run this distance at this pace and not have felt so beat up. So potentially there was some mental aspect at play too. And crazy though it may sound, I haven't done a long run in shorts and a tank since October, and maybe my body wasn't "used to" the low 40s. Sure, it's an ideal race temperature, but maybe it was a shock to my system since I am used to running in the low 30s? Unlikely, but possible. Greg and I made our way back to the hotel. He didn't have my jacket or long-sleeved shirt because he was planning to grab that from the hotel before I finished. We had over a mile to walk, so to avoid being cold, I jogged back to the hotel at a pace of 10:30. As I did this, I saw all the marathoners running toward me. It was sad to see them all still in the game, and I had given up so early. But I stayed strong in my head and knew that I made the right decision for me. Kind of an anti-climatic weekend after all this build up and planning. It's disappointing, but I knew going into Shamrock that it was a quick turnaround from Rehoboth. Potentially there wasn't enough down time in between but it was worth a shot. All along, I saw Shamrock as just "gravy" after how well I did at Rehoboth. I have my 2020 BQ and a marathon time that I'm super proud of. So I am not dissatisfied. I think I will be dissatisfied, though, if Cherry Blossom doesn't go well. I'm PR hungry, just not marathon PR hungry! All in all, it was a fun morning. It just wasn't MY morning. And there are many other mornings to come. Sorry to hear the Shamrocks got the best of you but you have the right idea. Most people who just keep going and be miserable and then have a miserable race in three weeks. Think Galen Rupp, he dropped out of Boston in that monsoon last year and three weeks later ran a personal best marathon in Prague. You've done all the training so I think you made the intelligent move to say this isn't going well, why torture my body. Lets PR in three weeks!! You totally made the right choice. You have a more important race coming up! And since you were already feeling the strain in your legs halfway through, imagine how beat up you'd be after completing the full? You could have been looking at a really long recovery. Smart to keep the strong PR you already have in the marathon and go for a ten mile PR in a few weeks. I take a different perspective and if you decide to not go the full distance, no big deal. Like you note you have nothing to prove. You are an awesome runner that has achieved a level of performance few can ascribe to. 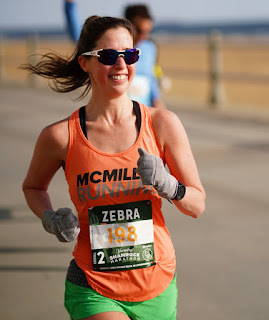 I love that you had "Zebra" on your bib...that says much about you that I admire. The race...or the marathon will not always go the way we hope...irrespective of the training we have done. And I reading your blogs know that you have been doing some stellar training. Sometimes I think you "over-think" and "assess" a bit too much to explain things. But from my perspective you have nothing to explain and just say not your day. Happens all the time...even with world elite marathoners. The training you do is stellar and everything in prior posts about training says you can run what that goal time was for this race. Sometimes I think you "over-think" all this either prior or post race. You are what you be...Zebra....has passion and drive to be the best she can be. That you have achieved...whether it smoking some marathon PR or other race...but you made it to Boston...you will be back again. For one put a lot of effort in that book "Boston Bound"...and a Zebra spent much time sorting out the psyche of what is important about what others think of you, or more importantly, what you think of yourself in what the end results end up being....what is important is that you do and pursue the "Unicorn" which is simply the symbol to represent that unattainable...but what we all strive to be? You are a Zebra and a runner of extraordinary abilities and potential...nothing needs to be explained...just be Zebra!